The perfect weld…without the 20-lb. tank. Welding is a safe and secure way to join two pieces of metal. But, what happens when you have to fix your tractor in the middle of your field or you car in the front of your house, when your garage is in the back? 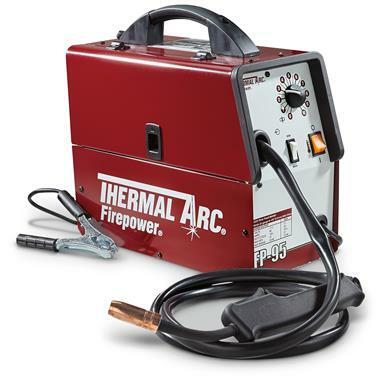 Firepower® has your answer with their ThermalArc Portable Gasless Flux-core Wire-feed Welder. All welders require a gas shield to work. Normally, you'd get this gas from a large tank you carry with you. This isn't practical in all environments. The ThermalArc uses a Flux-core wire to make its welds. This special wire produces its own gas shield to make the weld perfect, without the extra pounds. With its simple operation and key set up chart, even a novice can achieve high quality, professional results. It's constructed to be powered by a standard household outlet and delivers a maximum output of 90A output. It's perfect for outdoor use and is ready to weld at a moments notice.